Do You Really Want to Terz Me? We'll talk about Billy Corgan in a second, but first I want to address the question that's probably on everyone's mind as they read this: what in the Sam Hill is a Terz guitar? The short answer is that it's one of the coolest innovations in electric guitar design of the last ten years! The long answer begins in the early nineteenth century, where classical composers would often write tunes that required a higher-pitched nylon-stringed guitar to provide a contrasting voice to the deep resonance of the standard guitars of the time. So, someone had the brilliant idea to build a guitar tuned from G to G (essentially, it's the same as putting a capo on the third fret). By building guitars meant to be tuned a third above a regular guitar, they were able to achieve a brighter timbre that cut through the mix beautifully. Because of that exceptional projection, the Terz guitar was a valued part of many ensembles for a time. Eventually, as the musical landscape changed, the Terz guitar waned in popularity until it became little more than a historical curiosity. This is a shame, because Terz guitars offer a lot of interesting possibilities, but they probably would have languished in obscurity were it not for the combined efforts efforts of Reverend Guitars and William Patrick Corgan, Jr. While touring the world with the Smashing Pumpkins, Billy Corgan ran into a problem: he loved playing with a capo on the third fret, but hated the accompanying intonation and setup issues the capo created. So, he and the team at Reverend put their heads together and came up with a solution: build the first-ever electric Terz guitar! Apart from being a guitar of historical significance (after all, there aren't many "firsts" left in the world of electric guitar design! ), it is an incredibly inspiring creative tool and a live workhorse. Let's take a closer look at why this vintage oddity becomes such a modern masterpiece when electrified! I have no doubt that many of you are saying to yourselves "Well, that sounds cool and all, but what would I actually use it for?" This is a valid question--after all, a short-scale guitar with a different tuning is quite outside the box! However, after spending most of my morning playing these guitars, I can't stop exploring the plethora of sonic possibilities they open up! First and foremost, they sing with such a unique voice and they feel so different from a regular guitar that they inspire all sorts of new ideas! Terz guitars like this cut through the mix like a six foot-tall Ginsu, and they have tight, articulate bass. Also, this guitar has Billy Corgan's signature Railhammer pickup in the bridge position, which helps make the top-end incredibly sweet and responsive while also adding a delightful resonance in the upper midrange. All of this adds up to an instrument with a voice so singular that it should be considered an entirely different type of guitar, like a baritone or a twelve-string. I can only speak for myself, but every time I pick up a "non-standard" guitar, it always opens up the proverbial creative faucet and makes all sorts of new ideas flow out of my hands! The voicing is sure to make the muse come a-knocking, and the tuning allows you to pull off all sorts of interesting tricks in the studio. For instance, lots of record producers will ask players to track the same guitar part twice with different chord voicings. They may have one guitar player play in the key of A on a dreadnought with no capo for a deeper sound, then have another guitarist play the same chords on a small-bodied guitar with a capo on four using voicings from C major for a brighter sound. The timbre of this instrument makes it PERFECT for that sort of thing! You can play E major chord shapes in the key of G major, or tune down a half-step and play ripping leads with your E minor pentatonic scale shapes in the key of A major, or even capo it on five and get an electric mandolin-type sound. All things considered, the Reverend Billy Corgan Signature Terz guitar is the sort of axe that could easily become your secret weapon in the studio! Of course, Reverend always designs their guitars to handle a grueling gig schedule, and these Terzes are no different! They feature a host of appointments that make life easier for players. They have a Boneite nut and pin-lock tuners for superb tuning stability, a korina body with strategic chambers for extra resonance, a treble-bleed circuit so that you don't love treble when you roll off the volume knob, and Reverend's signature bass contour knob for tone-shaping. The comfy medium oval neck also features an angled heel, so the high frets are easy to access. 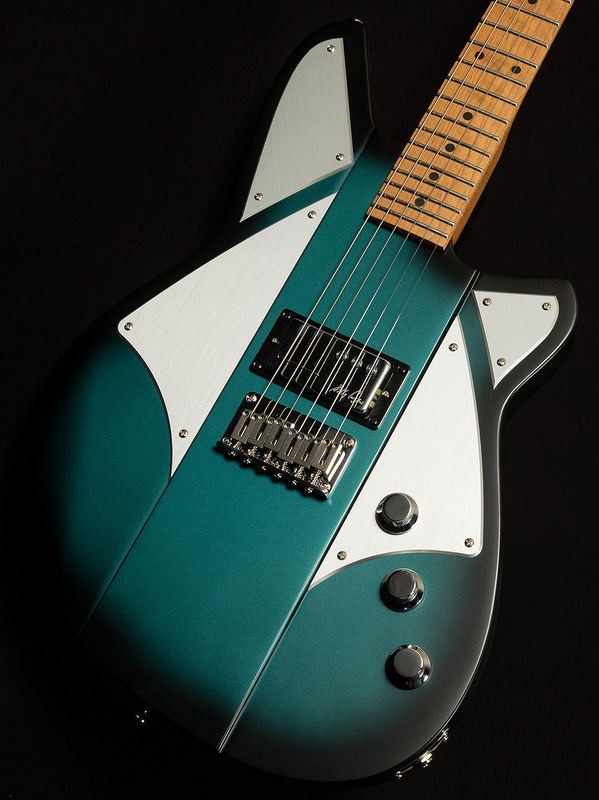 The team at Reverend has managed to accomplish something truly extraordinary by resurrecting the Terz Guitar. They've broken completely new ground in the field of electric guitar design, and the Wildwood team could not be more honored to showcase the historic product of their innovation. We know they will inspire you to reach new heights, and we are excited to see what sorts of cool ideas they inspire in you!